Found 2 file extension associations related to VodBurner and 1 file format developed specifically for use with VodBurner. 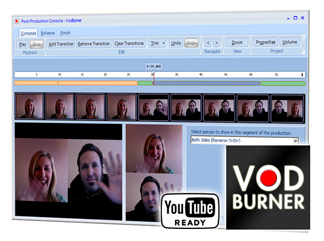 Developer / company: Netralia Pty Ltd.
VodBurner allows users to create complete video production from Skype video calls. Crystal-clear Skype recording. Revolutionary editing. Create complete video production from Skype video calls. Create MP4 or WMV files suitable for sharing with others. Record each party in the video call to separate files for greater control over mixing. If you need more information please contact the developers of VodBurner (Netralia Pty Ltd.), or check out their product website.